When the LifeKeeper Microsoft IIS Recovery Kit creates an IIS resource hierarchy, it creates dependencies associated with the IP address and content volume using the home directory path designated in the IIS configuration. We recommend that if you protect multiple sites, then you should designate DIFFERENT IP addresses and volumes for each site. 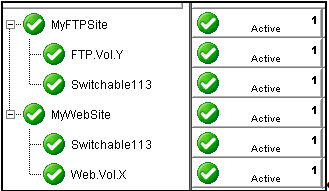 The hierarchy shown below shows both MyFTPSite and MyWebSite utilizing the same IP address and different volume resources. Any maintenance done on one site will affect the other site since these have common IP resource dependency.